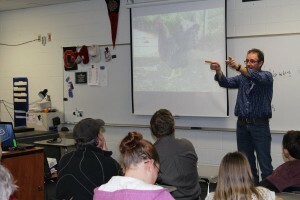 Home News OEFFA workshops offer wealth of info. OEFFA workshops offer wealth of info. GRANVILLE, Ohio — From livestock production to field crops and horticulture — this year’s Ohio Ecological Food and Farm Association conference offered guests more than 100 workshops in just two days, Feb. 15-16. In the Feb. 20 edition, Farm and Dairy focused on the two keynote speeches by author and organic consultant Atina Diffley, and former U.S. Department of Agriculture Deputy Secretary Kathleen Merrigan. However, there was a wealth of information presented by farmers, university professionals and industry experts. Most of the sessions were recorded and are now available for purchase at www.oeffa.com. In the area of backyard poultry, producers were reminded about the importance of selecting good, productive stock, and replacing animals that behave poorly. “You never need to put up with a mean rooster,” said author and homesteader Mary Lou Shaw, who led a workshop called Creating Sustainability for Your Backyard Poultry.Shaw told about a rooster she once owned named Hotshot, who was mean and spurred her. So, she replaced him with a much gentler rooster. While that may seem too simple — the solution really is that simple. Jim Adkins, poultry specialist with the Sustainable Poultry Network, said producers should start with good stock. But if they get a mean bird, the best thing to do is to get rid of it. Otherwise, it will create more birds just like it. “An aggressive daddy produces aggressive sons,” he said. This is one advantage small-scale producers have over large hatcheries, Adkins said, because small-scale producers have the time to cull their birds. Adkins led a talk on selecting heritage poultry, or historic poultry breeds.He gave five criteria for selecting productive birds, as adopted from the 1914 book The Call of The Hen. The first thing is to select birds with wide skulls, which usually leads to wide bodies and more meat. Other considerations include the size of the heart girth, back flatness, body depth, and straightness and quality of the breast bone. The back of the bird should be wide and long, which indicates growth potential. He told producers that to be profitable, they should seek at least $6 a pound on a four-pound carcass. That may seem like a lot, but it takes that much to cover all the expenses. In other workshops, former U.S. Secretary of Agriculture Kathleen Merrigan led a talk on accessing government grants for local foods projects. She walked producers through USDA’s Know Your Farmer, Know Your Food Compass — an online mapping tool that shows producers where grants and projects are taking place. Merrigan said not as many people are using the compass as she had hoped, but said it’s a valuable tool nonetheless. She encouraged farmers to be persistent when applying for grants, and to seek help with the grant-writing process. “If you don’t get it the first time around, you might get it the second,” she said. Many of the projects awarded funding actually end up failing, but Merrigan said that’s part of the process and part of taking chances. “You know a lot of these are not going to succeed because what we’re doing is cutting-edge,” she said. In a separate workshop, Mike Hogan, OSU Extension educator from Fairfield County, outlined the top 10 emerging marketing trends for 2014. The No. 1 thing is that local will be big — whether it’s local meats or local produce. He cites the National Restaurant Association’s annual What’s Hot Culinary Forecast, which lists local foods as the top trend for the year. The second trend is healthy foods, which includes dark greens and more plant-based protein, as well as healthy beverages. The third and fourth are signature foods and ugly foods — both being products that stand out and that are unique to specific farms. The fifth is that people are snacking more. He shared research that revealed one out of every five of today’s eating occasions is for a snack — not a meal. These on-the-go consumers want something that is bite-sized or hand-held, creating new demand for snack-size portions. Snacking is especially popular among millennials (18-34). And, many of the snacks they demand are actually healthy — replacing high-sugar, high-fat snacks. No. 6: social and mobile will continue to be big. This includes all major forms of social media, as consumers look to click their way to recipes and ingredients, and to read about a product. 7. Food packaging is changing, with more sensory-stimulating packages that tell the story of the product, and more packages that are edible. 8. Consumers want foods that are sustainable and that produce less waste. 10. Technology will continue to grow, whether it’s robotics, aeroponics or growing indoors.